You may remember that I posted my hair commandments last month, and I am pleased to say that sticking to them has started to pay off. I’m blow drying my hair less (I’m permitted a maximum of three a week), and letting it dry naturally where I can. Where this used to end with my hair knotting itself into a helmet of frizzy curls, something miraculous has happened: it now dries soft and reasonably sleek, with a few waves that look pretty and natural, rather than crisp and tortured. It’s also been six weeks since I coloured my hair, and as I’m almost back to my natural shade, roots aren’t too great a problem. It’s probably the longest I’ve gone without colouring my hair in the past ten years. I’m impressed! In case any of you have been inspired to take up the healthy hair challenge, I thought I’d update you on my Hot Hair product arsenal, and the things that I rely on to keep my tresses tamed. 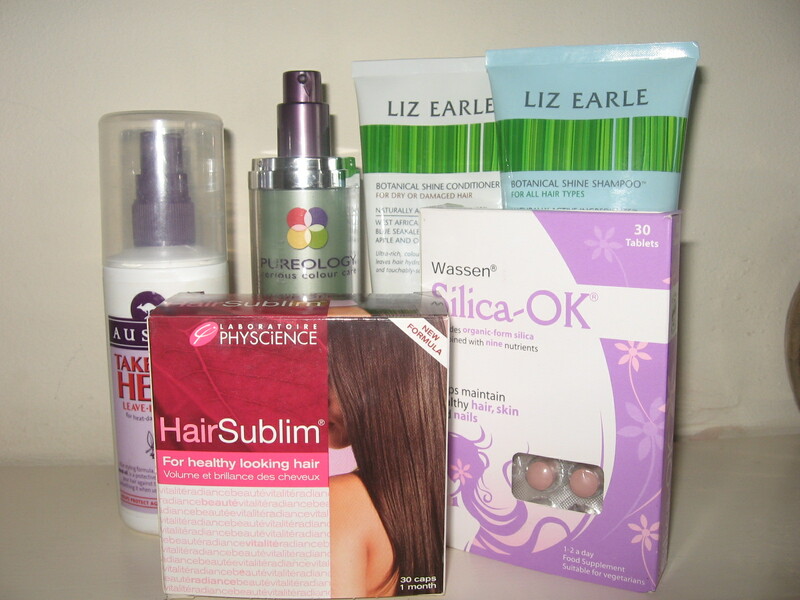 The Liz Earle shampoo and conditioner continue to be a big hit with me. The conditioner is so rich and certainly the best I've ever used (yep, that takes into account pretty much all the high end haircare brands). It comes out on 2nd September, and I for one can see this becoming a permanent feature in my haircare routine. I’ve talked about both the Aussie and Pureology products before, but the Pureology in particular deserves to be revisited. I wasn’t convinced at its split end ‘repair and prevention’ claims but it’s five weeks since I had my hair cut, but the frazzled ends are mysteriously absent. Of course, the situation is probably helped by the limited heat styling, but if things continue this way, I will definitely repurchase this product. Aussie’s Take the Heat spray is the cheapest product here, but it’s also the one I wouldn’t be without. Nothing protects my hair like this, and I love it so much, I even spray my hair when I’m not heat styling it! I’m sure that everyone who reads Lollipop26writes will have rushed to their nearest Boots when they read Laura’s posts on HairSublim and Silica. 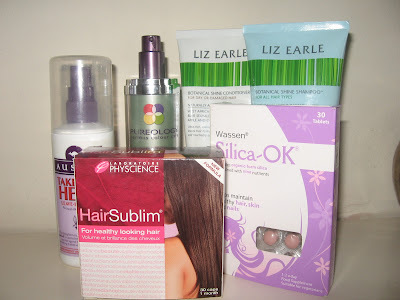 The products provide the essential nutrients required for healthy hair, and I have to say, I really feel as though my hair growth has quickened. It’s only been a month, but I’ll be stocking up on these supplements and hoping for swishy long hair by Christmas! 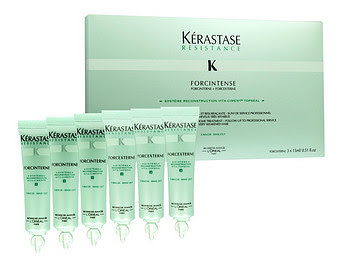 My final hair essential is Kerastase Resistance Forcintense. The pack contains three two-step treatments and is for hair that’s in need of some serious TLC (I’m talking over-processed, dry, damaged and colour treated here). I’ve just run out of my last batch, but it’s something I use at least once a month and for a few weeks after colouring. It’s £21 for three treatments, but if you have very damaged hair, it’s definitely worth the investment, in my opinion. I’d be really keen to know about your haircare routine, and what products you can’t live without!